Please note this figurine has been repaired. The door broke off but has been superglued back into its slot. The crackline is visible on close inspection on the rear of the figurine, out of view. An excellent repair has been completed. 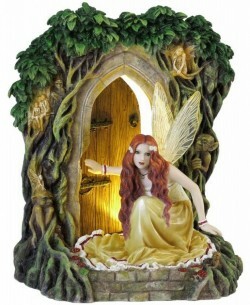 Yellow fairy outside her tree home. Lots of forest spirits can be seen in the plants around the home. On/off switch to illuminate the doorway. Takes 3 x AAA Batteries.